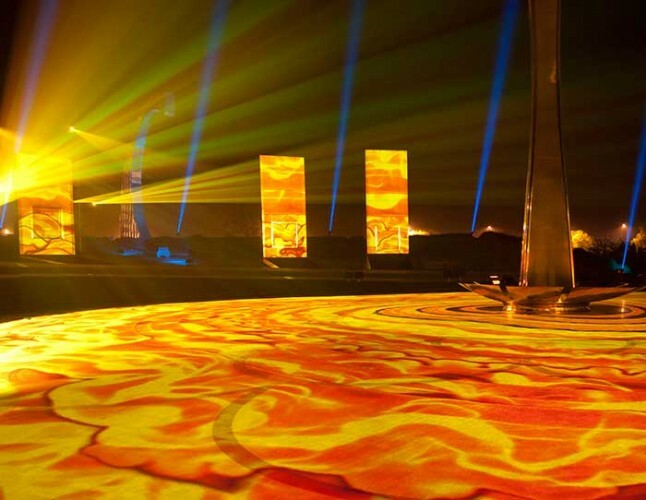 London based projection artist Ross Ashton designed and specified the large format projection elements of a new permanent immersive multi-media spectacle in Delhi, at the Guru Tegh Bahaur Memorial on the NH1 highway at Singhu Border. Ashton and Himanshu Sabharwal, his business partner in TricolorIndia, were commissioned by the Delhi Tourism & Transportation Development Corporation (GTDB) to create the piece, for which Sabharwal was the overall show director. Their brief was to create an awesome looking immersive experience that had a universal spiritual appeal to people of all faiths, and that could work harmoniously with the new age minimalist architecture of the monument. 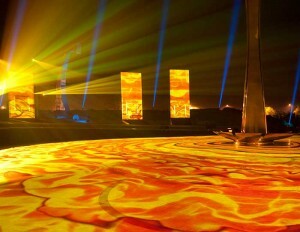 TricolorIndia delivered the entire technical infrastructure involved including projection, lighting and audio. Hailed as the largest installation currently in India, the challenge was to ensure that the substantial amount of equipment and engineering involved seamlessly dovetailed into the beautifully landscaped site. The looped 20 minute visual show runs every night and is based on the phrase ‘Hind ki Chadar’ a popular reference to the Guru Tegh Bahaur which energises ‘Kudrat ki Chadar’ the five elements of nature – earth, wind, fire, water and void. Ashton and Sabharwal came up with a concept which was then dramatically interpreted for them as the five elements by sarod maestro and Indian classical music legend, Ustad Ali Khan. The five elements are represented by fantastical imagery, starting with the Void and ending with the Earth, incorporating a myriad of potential and interlinking ideas and suggestions and including amazing visuals of flying fish, giant butterflies, flying kites, etc,. all of them drawn from the imagination and magic of Indian mythology. The massive monument has a central tower that represents Guru Tegh Bahadur, with three semi-arches signifying his three disciples and ten surrounding monoliths denoting ten Sikh Gurus disseminating their teaching. There is a 45 x 45 metre diameter circular surface at floor level. The monument is projected onto by 16 Christie 20K Roadster machines, specified by Ashton for their robust build which had to withstand the climate and outdoor environment, and excellent brightness. Six machines are focused on the floor area and the other ten cover the five metre wide panels of the ten monoliths. All 16 projectors are mounted on the top of purpose built pylons, designed to integrate with the architecture of the monument. The pylons are a variety of heights between five and 10 metres, each about 5 metres wide. Covering the floor area was a real challenge as the projectors are beaming down at very steep angles, and some serious keystone correction was needed in the Dataton Watchout control system, which also facilitated all the necessary edge-blending. Watchout was chosen as the most appropriate control system for this project by Ashton, which is run day-to-day by a local site crew. The lighting specification includes 16 PR300 Beam and 12 PR-8802 fixtures from PR Lighting which are run from an Avolites Titan Mobile in conjunction with the Watchout system. Show audio is played out via a Tannoy system driven by Labgruppen amps. The content origination was completed through UK based company The Projection Studio, and TricolorIndia oversaw the projection installation on site. India is one of Ashton’s favourite countries. He says: “It was really great to be back in India again and have the chance of realising this amazing work in conjunction with some extremely inspirational people. We hope TricolorIndia will be doing more video and projection installations in the near future”.